McRaven House was built in 1797 by Andrew Glass in a town called Walnut Hills. Poltergeist activity has been recorded, along with a civil war soldier's ghost still wearing his Union Army uniform, roaming the ground's at the McRaven House. During the Civil War era, it was known as the Bobb House, and it is listed on the National Register of Historic Places as such. McRaven got its current name from the street it is located on, which was formerly called McRaven Street, but now Harrison Street. 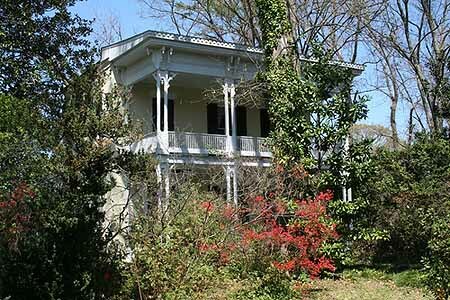 It is believed by many to be haunted, and has been called "the most haunted house in Mississippi." In 1836, Sheriff Stephen Howard bought McRaven house and added the middle dining room and the bedroom above it. Sheriff Howard's 15 year old wife Mary Elizabeth Howard died during childbirth in late August, 1836 at the property. The siege of Vicksburg during the Civil War is perhaps one of the most memorable events of the conflict. During the spring and early summer of 1863, General Ulysses S. Grant had tightened a military noose around the city. More than 200 Union guns pounded the town on a daily basis. The McRaven house was used a field hospital for the Confederate soldiers during the battle. As food ran low inside the city and people were reduced to eating mules, horses, dogs and even rats were sold in the butcher shops. By late June, nearly half the Confederate Army was sick. On July 4, 1863 the Confederates of Vicksburg finally surrendered and the Stars and Stripes were raised above the Vicksburg courthouse. After the battle the house was as the command post for the Union Army, it was used by Colonel Wilson, who was in charge of the Union troops and a Captain McPherson, a former resident of the city. McPherson served as the liaison between the occupying troops and the residents of the town. One night, McPherson failed to return from his usual rounds and was declared missing. A search was started, but the young man was not found. Several weeks later the Colonel was awakened by a noise in his bedroom. He fell back asleep in his rocking chair, only to be awakened again by the motion of someone rocking the chair from behind. He leapt up, and there before him was the figure of a man. Upon closer examination, he realized it was his missing friend, Capt. McPherson. Joy turned to horror as he noticed that the side of the Captain's head was mutilated and his clothes torn and wet. The Captain weakly stated that he had been beaten and thrown into the river by former Confederates. He told the Colonel that his murder should not be avenged, for he did not want the next generation to grow up hating them like this one did. Capt. McPherson's ghost still wearing his Union Army uniform has been seen roaming the ground's at the McRaven House during the day and haunts the streets of Vicksburg by night. Almost a year after the siege May, 1864, John Bobb had McRaven House returned to him. Soon after moving back in he found a group of six drunken Union soldiers picking flowers from his garden. Bobb angry, ordered them to leave immediately, the soldiers cursed at him and refused to leave, so John picked up a brick and threw it at them, knocking a sergeant to the floor. The soldiers left, vowing to come back for revenge. Bobb reported the incident to the Federal Commander of Vicksburg, Gen. Henry W. Slocum who dismissively said he would admonish those responsible. Upon returning to the gates of his home, Bobb was met by 25 Union troops who took him to Stout's Bayou, about 100 yards from the house, and fatally shot him in the head and back. Bobb's death was the first recorded act of violence perpetrated by Union troops after the siege. John Bobb's ghost often appears to visitors in a room just off McRaven's main foyer, his apparition is usually stood in the corner of the room. His ghost has also been seen at Stout's Bayou at the spot where he was murdered. The ghosts of civil war soldiers are seen in the grounds of the house by startled tourists from time to time. McRaven House was eventually sold to William Murray in 1882. Murray and his wife Ellen Flynn raised four daughters and three sons in McRaven. William Murray died at the house in 1911, his wife Ellen died there in 1921, their daughter Ida died in 1946, and a son died in 1950. In 1960, the house was sold to the Bradway family, who restored McRaven and opened it to the public as a tour home in 1961, which it remains today. In 1984, Leyland French purchased McRaven and did further restoration, French was the first owner since the Murrays to reside in the house. Aside from a modern kitchen and bathroom in its basement, McRaven has remained largely unchanged since the 19th century. Reports of paranormal activity are spread throughout the house; the center of activity seems to be the middle bedroom upstairs, the room where Mary Elizabeth Howard died during childbirth. Her ghost has been seen in the corner of the room, and on the bed where she passed away. The bedside lamp in the room is reported to turn on and off, seemingly at will. Mary Elizabeth's ghostly apparition has appeared on the house's flying wing staircase, and in the dining room. Mary Elizabeth's wedding shawl is displayed at the house; some people say it emits heat, while others claim it feels as if it is going to jump out of their hands. Not long after current owner Leyland French had purchased the property, a tour guide was bringing a group through the house when one of the tourists asked if the piano in the parlor worked. The guide pressed a key to find that it in fact did not work. When the group was exploring the bedrooms, the sound of a beautiful Waltz was heard from the piano in the parlor. The guide quickly made her way downstairs but found the room empty. As time passed, the disturbances got worse the atmosphere became oppressive, a new demonic presence seemed to roam the House. On one particular occasion, a door was slammed through its own volition on the hand of Mr. French, causing injury. On another occasion, the owner states that as he walked through the parlor, he was pushed to his knees from behind by an unseen entity. He then saw the ghost of former owner William Murray on the staircase, fearing for his own sanity he moved out until an exorcism could be performed. The atmosphere now is a benign one, although ghosts are still seen at the McRaven House. The ghost of William Murray is still seen by visitors usually at the top of the flying wing staircase. Murray's wife and daughters ghosts haunt the grounds of the house. You have the best chance of seeing there spirits early in the morning or at dusk.